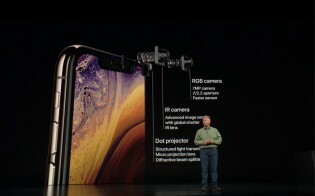 The iPhone Xs Max is the largest iPhone in history with an expansive 6.5” AMOLED screen. The bezels have dissolved, giving the screen a tall 19.5:9 aspect ratio and leaving behind a notch. 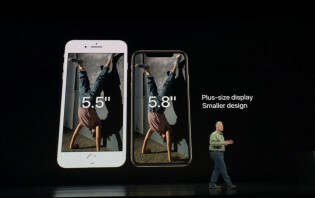 The new screen has essentially the same width as the 5.5” panel on the iPhone 8 Plus, but the extra height accommodates additional content. The new "Super Retina" display maintains the 458ppi pixel density of the iPhone X by bumping the resolution up to 1,242 x 2,688px. For smoother operation, the screen's touch sensing layer runs at 120Hz (but the UI still renders at 60fps). The display still supports HDR10 and Dolby Vision, but the dynamic range has been increased by 60%. Touch ID is dead, long live Face ID. Apple has refused to move the fingerprint reader to the back, leaving the 3D face scanner as the only biometric authentication method. A faster security enclave has sped up facial recognition compared to the first generation. 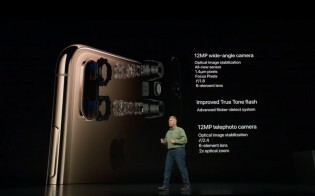 The dual 12MP camera has been completely revamped. The main wide-angle shooter has an all-new sensor with larger pixels – 1.4µm, up from 1.22µm. The aperture remains at f/1.8. The telephoto camera uses a 12MP sensor, f/2.4 lens with 2x optical zoom (and it has OIS). The selfie camera has been improved as well. 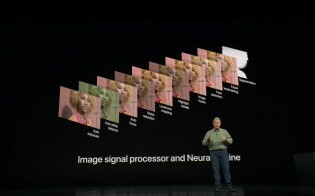 The 7MP RGB sensor has improved in speed if not in resolution. Video recording now supports stereo audio - finally! - and wider dynamic range. 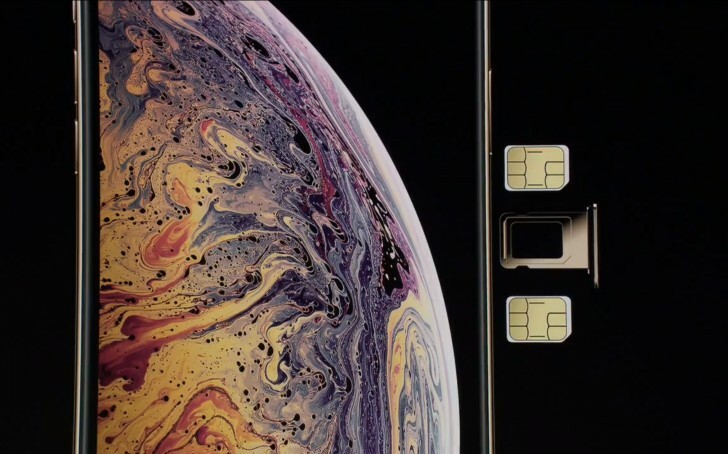 The iPhone XS models have a stainless steel chassis and a new formulation for the scratch-resistant glass - Apple claims it's the most durable on a phone. 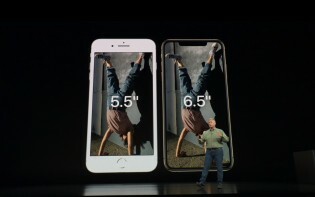 Apple also bumped up the water resistance to IP68, so your iPhone should survive for half an hour under 2 meters of water (or beer, apparently Apple tests for every scenario). Apple is sticking with 64GB as the base storage, but the highest capacity is now 512GB to answer the challenge from Android flagships. The 256GB option is now the middle ground. 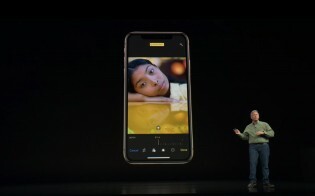 The Apple iPhone XS is a proper S-model – it builds on the hardware and features from last year without changing too much. So, physically little has changed, but as they say “true beauty is on the inside”. The Apple A12 Bionic chipset will leapfrog Android flagships in performance and it has more memory to work with than its predecessor, plus a cool 512GB storage option. The base remains at 64GB and there's a 256GB version too. This should be the first 7nm chipset to hit the market. It features a 6-core design (2 big + 4 small), plus a 4-core GPU and a new 8-core neural engine, which add up to a whopping 6.9 billion transistors. All Apple-designed. All told, the big cores are 15% faster and 40% more power efficient than the A11 cores. The power usage of the small cores has been cut in half. The GPU offers 50% higher performance and higher memory bandwidth thanks to lossless compression. The neural engine has "only" have twice the number of cores as the previous generation, but it's hugely more powerful - it can do 5 trillion operations, up from 600 billion. Anyway, the 5.8" screen has the same resolution as last year's model - 1,125 x 2,436px. Pixel density matches the Max model, same for the touch frame rate (120Hz). Apple also improved the stereo speakers to deliver wider sound. A stupid notch the divide notification bar compare a protective Aluminium 7000 series notch for the USB port, I definitely love the practical more than the stupidly trends!